No one likes surprises when it comes to bills and expenses. I’ve spoken with thousands of board members over the years and one of their top complaints is that they don’t know where their money is going. If you don’t know what your community expenses are? Here’s a solution. 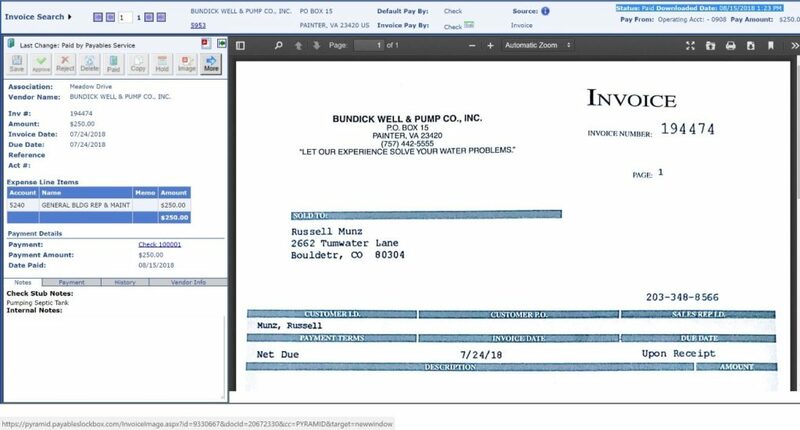 You can look at paper invoices but even better is seeing the image of the bill online – from anywhere. With your unique login you review the bill for accuracy and to ensure the work has been completed before it goes on for payment. Our staff codes the GL (General Ledger) accounting code so it goes to the correct line item in your financial reports. After reviewing the bill you click on the approve button before we pay it. Instead of signing paper checks this is your digital signature that is date and time stamped for each invoice. We recommend 2 people approve a bill before it is paid. This can be a manager and then a board member usually the Treasurer or if self-managed 2 board members usually the Treasurer and President. This provides oversight. When you get beyond 2 approvers then delays in paying bills can start to happen and you risk incurring late fees. For a second board member approving bills we can reduce the number of bills they have to review by limiting their approval to only bills over $500 or skipping utility bills. This still provides oversight but reduces the workload and chances of late fees. 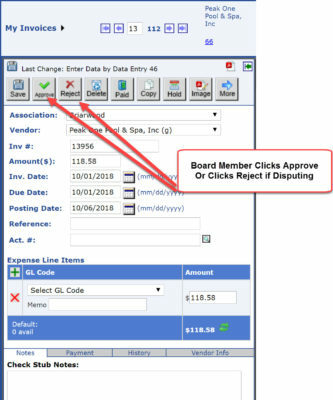 Do you want the entire board to have viewing access for all of your bills in our online approval system? We can provide access for additional board members to have review access to the system. They don’t have the responsibility to approve bills but can view all approved bills. 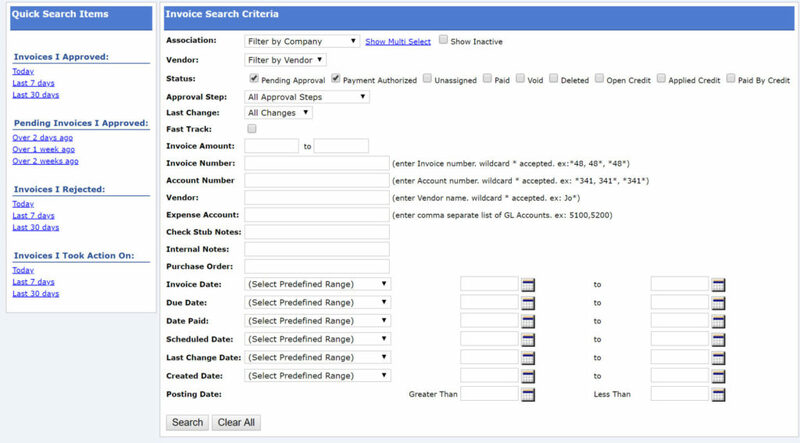 The invoice search capability of the system allows for a great way to quickly look up how much the community spent on a vendor or a type of expense for any given period of time. Ditch the old file box and painstaking receipt look up and calculations! We also provide this view access to a CPA that audits your community financial records – it saves them time which saves you money. Advanced technology used to only be available to large management companies and their clients. Now this technology is available to your association from Community Financials. If you don’t know what your community’s expenses are? Here’s a solution. To learn more you can watch this video demonstrating the online bill approval system. When you are ready and want to discuss a price quote for financial management services schedule a free, quick consultation to discuss the specific needs of your community. Start improving your community’s accounting process and its transparency.